So, where did I get to? Oh, I remember. The last thing was the great rowing boat trip on a Loch of one’s own. Ah, holidays. I am seriously wondering if they really are worth all the time and effort and dare I add stress. 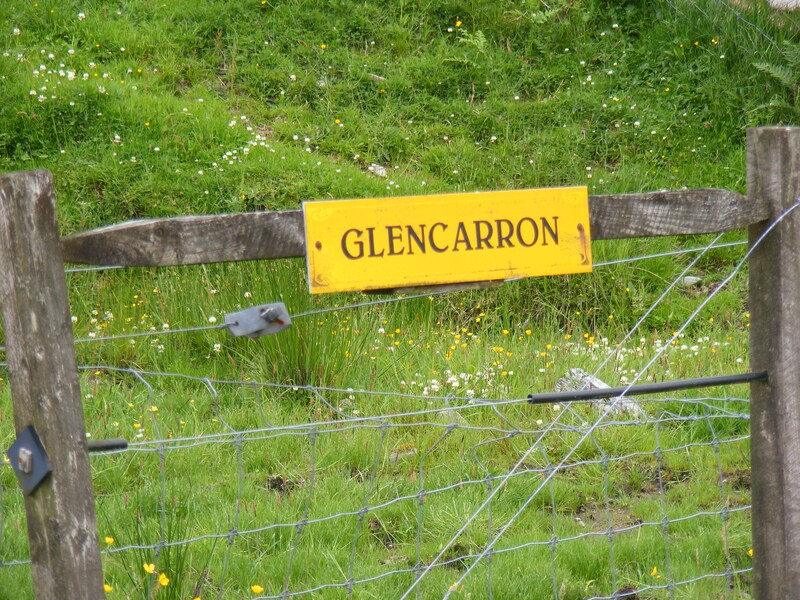 We finally said goodbye to Glencarron and Ba Ba black sheep. I now have the fun of phoning ‘Bon Prit’ to see if I can return one lamb nibbled skirt. I have no doubt they will say ‘no problem.’ (NOT). Now, for all the news I left out. Did I feel you shudder? Also, did I mention that I barely got out alive? The midgies nearly ate me to death. It really was worse than ‘The invasion.’ I must have spent the last week scratching myself to pieces. My legs are still not a pretty sight. Not that they ever have been. I hate to admit, that for me, the best part of the holiday was having a dishwasher. I feel embarrassed even mentioning it. Oh, what a luxury. What a difference. I mean, I told Andrew a dishwasher would change my life. I even swore it would cure my PMT. He looked doubtful. I do not hold out much hope of obtaining one. The tiny television was something of a let down. I had taken my new boxed set of ‘24’ thinking I would be watching it on a great plasma screen and instead had to peer closely at a 12 inch monitor. One cannot have everything I suppose, but that would have been nice. Our first week was fairly uneventful. I got over the shock of not holidaying at a Blenheim look-alike and finally settled down. I actually became quite attached to the two cats, three dogs, and one lamb that followed us about. Brian the stalker was very helpful, that is when he heard us knock at his door which was not as often as we would have liked. On the Wednesday Andrew chose to do some clay pigeon shooting. I have never seen my husband behind a gun. He has seen me behind a knife admittedly, but I had no intention of being in the same vicinity as my husband when he had a shotgun. I stayed at East cottage reading my racy little novel and jumping every time there was a shot. I prayed each time that he had not killed the stalker. It then began to pour with rain. I expected him to return but it seems Brian had just laughed when this had been suggested. ‘It’s a wee drizzle man,’ he had declared. Yes, well. One man’s drizzle is another’s soaking. Andrew came back full of his days fun and then winked at me. I jumped up and down in glee. I am not sure why. From the outside it looks like something out of ‘Great Expections’. So, my only expectation was seeing lots of cobwebs. Oh, what a surprise. The place was amazing. Enough bedrooms and bathrooms for 20 people. I already started planning a murder mystery evening until my dear husband brought me down to earth. He began telling me about the owners and I realised, not for the first time in my life, that we do not live in a classless society as I keep deluding myself. It seemed the poor stalker was not treated at all well. All the correspondence we had been sent had indicated the stalker would expect a gratuity fee each time he took us somewhere. This fee was something like £30. But when we tried to give him anything, he was deeply offended. He obviously has no idea this is sent out to holiday makers. I was left speechless when Andrew told me that once Brian had been stopped by the owner after being given two scones by the cook. He was asked to explain himself until he eventually handed them back. I left the Lodge feeling quite sad that there are some people who will always think they are better than others simply because they have more money, or a better education. Maybe I am naive to think we are all the same underneath. That everyone is deserving of love no matter how educated or rich they are, and also deserving of respect. But, the reality of life is that I soon forgot this and continued with my holiday. We phoned home to check my car was back after its MOT. I already knew that was going to cost around £600. The cat was doing fine. He had his stitches put in and all in all that had cost another £300. So, already we had spent a £1000 just sitting in our holiday cottage. The following day we decided to have a quiet afternoon. I chose to read while Andrew studied. Suddenly Buster the dog jumped up to the window with a thump and sat staring at us. We in turn stared at each other. We knew we were both thinking the same thing. Do we let him in. His sad watery eyes pleaded with us. I opened the door to be knocked over by Buster who was quickly followed by Ba Ba black sheep. Suddenly mayhem broke loose. Buster skidded around the house like a racing car, while Ba Ba black sheet bleated away in between getting small nips on his leg by Buster. We quickly tried to gain control but all was lost. The cats had now run in. Suddenly we were overrun. Buster was barking like mad and trying to bite the lambs leg, while the cats rubbed themselves affectionately against us. Suddenly Buster grabbed the lamb and was dragging it by its leg outside. It seemed jealousy had reared its ugly head. ‘Oh my god, do something,’ I screamed. I opened my mouth but of course I had no idea either. At that moment Brian came to the rescue and suddenly all was quiet again. We both let out a sigh of relief. ‘I think a day out tomorrow,’ was Andrew’s only response. So, the next day off we went to a castle. As we started the journey, all seemed well. On the way back our car turned into a kangaroo and after 10 mins halted altogether. ‘It’s nothing. I just need to reset it and it will be fine. I get this sometimes going to work,’ says my ever laid back husband. ‘There,’ he says getting back into the car and starting the ignition, which doesn’t actually start. ‘Strange,’ he gets out again. I sweat a bit more. This time it does start and we are off again. Five minutes later it is spluttering. ‘Oh no, we will never get back home like this, how will we get back to work,’ I say helplessness evident in my voice. Ok, so we are not going home for another four days, but one needs to think ahead. Not my husband. Life is one day at a time. No, I exaggerate, one hour at a time. No, I exaggerate again, one minute at a time. So, I get a look which even I cannot describe. We get going again and make it to Loch Carron, which is our local town, kind of, if you call almost twenty miles local. There is a garage there. We stress we have to get home on the Saturday. They agree to have a quick look at it while we do some shopping. It is freezing cold, windy and rainy and I have on just a light top. With teeth chattering we walk to the shops. An hour later we return to discover they need a part and cannot do it till the Friday after all. We climb back into what I now view as the monster, and begin to head back to the cottage. We manage to drive about 200 yards and the car breaks down. we are towed back to the garage and one of the men there drives us home in his pick up. Great, now we don’t have a car. Even the loch where the rowing boat sits is too far to walk. We get home full of shopping and Andrew lights the fire. I attempt to relax and not worry. I feel sure the car will be ok. They seemed to know what was needed and had ordered the parts. ‘But who will take you to pick it up?’ I ask suddenly. I have a tendency to do this. We may be sitting in total silence for hours and I find my mind racing and then the last sentence will just roll off my tongue. I forget the rest of the world has not been in my head with me. Andrew gives me a confused look, works it out as he always does and responds. I hate to tell him that I am way past Friday’s problem. I am already on Monday’s and getting back to work problem..
That night I lay awake listening to all the strange house noises mingled with Andrew’s snoring and suddenly hear a loud bang. My heart thumps. I lay tense but all is quiet. I close my eyes to sleep and then, bang again. Nothing.. I thump him on the back. I pretend to ignore his deep sigh. I listen with ears pricked as he makes his way downstairs and grab my phone, struggling to recall if I dial 999 on a mobile or is it something different. Andrew comes back safe and sound. I cringe under the covers. Friday arrives and I truly am a wreck. I try doing what if’s with Andrew. He is not playing. At 2.30 Brian knocks to ask if we need a lift to collect the repaired car. Is that a good omen, I think, that Brian says repaired car. I stay at the cottage and wait. Thirty minutes later Andrew comes back with the car on a tow truck. I feel tears begin to prick my eyes. ‘It’s a complicated software problem. We have two options,’ he tells me calmly. I fight my overwhelming desire to get hysterical. I hate options. There is never a good option in my experience. Is he mad? Have the midgie bites made him demented? I cook dinner with shaking hands as he phones breakdown companies and amazingly gets us booked in with two after telling them we have a problem with the car and are 600 miles from home. He tells them the problem and he is also amazed they agree to accept us. I debate whether I can bear to do this journey again, ever in my life in fact! The decision is made to attempt the journey home in the monster. That night I barely sleep. By the morning I am exhausted. Andrew is positive. I have gone through all the what if’s and am as prepared as I can be. Believe it or not, even with toilet stops we made it home 16 hours later and the car is still going. As for Scotland. It was lovely, but I think I will really check out the details of my rental home next time and always remember they take the best photos of the place. I am still secretly thrilled I broke a knife that was already falling to bits and they did not even notice and gave us back our deposit. Now that is a result I say.